I have been riding trikes for a few years and, while I had been happy with all the trikes I've had before, I was really looking forward to getting the new Catrike Villager. I am not a technical writer, so I won't comment on all the detailed specifications of the trike, but I hope to convey more about how the trike feels as I ride it. I received a beautiful aqua Villager for Mothers' Day this year. I had been hinting around about it for a few months and I thought the aqua color was neutral enough that my oldest son could take it for a spin without being laughed at. I secretly really wanted one in hot pink, but the Aqua is so cute. I know the color shouldn't really matter and it has nothing to do with the trike's performance, but that said it is nice to have so many choices. Unfortunately, I put on quite a bit of weight last year and it's my hope to trim down a bit while riding. While I loved the last trikes I had, the main reason that I wanted the Villager is because I never felt comfortable sitting so low to the ground. The Villager sits up high and has a fairly upright seat angle. It is so easy for me to get in and out of. The seat comes with pockets and padding on the side which kept my chubby thighs from feeling pressure. The pockets are very handy for storing my cell phone and keys and other small items. The tires that the Villager come stock with are the Marathon Racers. I used to get flats all the time on these gravelly country roads that I ride on with the no-name tires. The Schwalbe tires feel much more resiliant and give me a lot more courage to go farther from home. A couple years ago my son would ride one of my trikes to piano class once a week and he never failed to get a flat. You should see my driveway and some of the roads I go on in this unincorporated little town and surrounding area! When I first rode the Villager I noticed a little bit of pedal steering. I didn't know that was the term for it until I asked, and I guess it is pretty common if you don't adjust the trike perfectly. Basically if I pedal hard the trike would sway opposite the direction of the pushing foot. I have one knee that is a little messed up from all the exercise videos I do so it hurt a little to ride it at first. Then, Ashley adjusted the length of the boom and soon I hardly noticed any pedal steer at all and my knee didn't hurt any more. So I'm sure that if anyone has similar complaints all you have to do is some simple adjustments. I really love this trike! It is very sturdy and is very lightweight and practically rides itself. It rides smooth and it stops on a dime. One of the first things I noticed with the Villager is that I don't have to make any three point turns. Wow what a luxury! We have narrow roads out here in the country and I have had no problem doing U turns at all. I really like the stock shifting setup that the Villager comes with. It shifts very easily. I started out with the stock 9 gear setup and realized after my first ride that I needed more than that. I was already riding on the highest gear to try to keep up with Ashley, and he was keeping it slow for me most of the time. It has been great going for early morning rides together and helps me get a lot of exercise before the kids are up. Even though I had let myself go a little I had continued to always exercise on our eliptical machine and those exercise videos that work on your abs and such that you see advertised on TV, but I really missed riding a trike. Riding it in the morning helps me feel resolved to eat healthier during the day. When I ride my trike I just feel healthier and happier I can't help but smile when I'm riding and the smile doesn't go away just because I'm home. We have really long winters here in Utah and I just got out of the routine. That all has changed, I have a new resolution to ride my awsome Villager. This review has been a long work in progress. As I had written most of it Ashley took my Aqua Villager away and replaced it with a hot pink version with all the new extras on our anniversary. I can't believe he did that. I was so excited to ride it! It is oh so cute. My new trike has the Big Apple tires for maximum comfort. It looks kind of like a pink Monster Truck! There is definitely no more pedal steer which leads me to believe that the tires make even more of a difference than I realized. I went out for a ride by myself this morning to test it out. I went on the bumpiest road that I knew of which so happens to be on the next street over. It rode so smooth I could hardly believe it. One problem that I had was feeling all the vibrations on the road here in rural Utah county. I talked to myself to see if I sounded like I was talking into a fan as I loved to do as a child. There was no robotic fan voice! It'll be great to go out with Ashley because now I can carry on a conversation and chew gum since my jaw no longer quivers as I ride. The boys at Utah Trikes took care of my gearing too. Ashley had the guys install a Schlumpf high speed drive on the front. At first I didn't really understand how I was supposed to shift it, but it is so easy with a little practice. All I have to do is click on it with my heel, the left for low gear and right for high gear. With the new Schlumpf I never run out of gears. I can go so fast that the wind whistles in my ears and my long hair flaps behind me. It feels so surreal -- like I am in a movie or something. Yes, my husband does love me! This is such a great birthday and anniversary present. 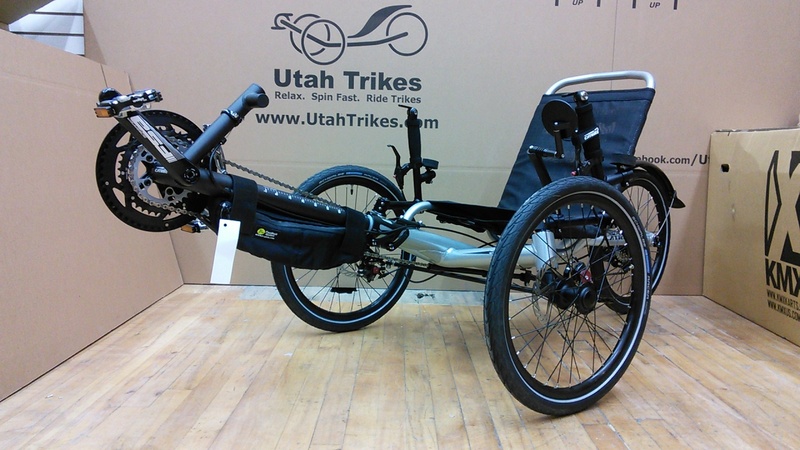 Once again the guys at Utah Trikes did an outstanding job totally pimping out my new ride. I'll probably get a basket or a bag to go on the back to complete the look. I totally love it. This is truly the trike I always wanted. Like I said earlier, the color shouldn't matter, but it does to me. I feel so cute when I ride my hot pink villager. I feel like I'm one of those Teresa dolls riding a barbie convertible. In the end how you feel about yourself and what you ride will influence how much you ride. My Villager is so comfortable that I can ride it for hours without hurting or needing to stop. That is important to me. The boom can be adjusted to fit your exact size for maximum comfort and control. 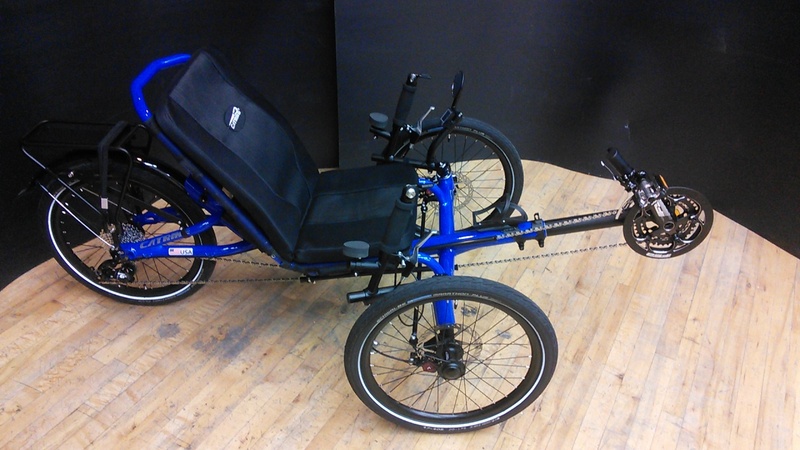 The brakes stop on a dime, and the trike practically rides itself it is very smooth and stable. The structure of the Villager is very strong. I am so impressed at how light weight it is also. Before Ashley had to lift my trikes for me. Now, I feel empowered to do it myself. All in all, I am very happy with the Catrike Villager it's the perfect trike for me. Sonia is a daily rider and contributes often to the Utah Trikes Blog. If you'd like to read about her daily triking adventures visit the blog.